RENAISSANCE had noticed that many mentally disabled children both male and female were roaming in streets without proper care and many did not even know to do their daily living skills. Due to some aggressive behavious on their part, some were even locked inside the rooms for days together. Parents were ignorant of how to deal with such children and the community neglected the children. These children were prone to diseases easily due to their lack of understanding of Hygienic living. Some had Psychiatric problems. Some lacked Motor and intecllectual development. Though there were schools for physically hadicapped, there was no special school for intellectually challenged children. Renaissance thought of Supplying the omission and hence the blossoming of a Special School "MALARCHI" for intellectually challenged children. Pudukkottai is one of the most backward districts in Tamil nadu. It is largely Rural Oriented. As against the Total Population of 13.22 lakh, Rural Population alone accounts for 11.33 lakh. According to a survey taken in the year 2003, the number of Intellectually Challenged Children in Pudukkottai District is about 2718. Hence there is a need for special shool- not one - but many -for the Intellectually Challenged Children here in Pudukkottai. 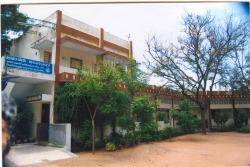 Renaissance amoung its various activites started a Special School "MALARCHI" for the intellectually Challenged Children during the year 1992, with an initial strength of 25 Children at a rented place in Pudukkottai, and then shifted to the present location at Kalamavur Village,34 Kms away from Pudukkottai.